Busy patterned papers often look absolutely gorgeous, but when it comes to using them, it is difficult to incorporate them into your page without totally overwhelming everything else, including your photos. This layout shows that by using multiple mats and focusing any embellishments directly on your photo/s, you can draw attention to the important aspects of your page while still being able to use those stunning, but busy backgrounds. This layout was created using papers from the Chatterbox Rec Room collection (Rec Scarlet Flowers Paper, Rec Sandbox Flowers Paper, Soft Rec Stripe Paper and Scarlet Rec Daisy Paper), dark blue cardstock and white cardstock. Set aside your Rec Scarlet Flowers Paper for your background. Cut a 12" strip of Rec Sandbox Flowers Paper approximately 11.8cm wide. Now cut a 12" strip of Soft Rec Stripe Paper approximately 7.7cm wide. Try to make sure you have a blue stripe along the outside edges. Centre this on your strip of Rec Sandbox Flowers Paper and adhere. Now mat with blue cardstock. Keep in mind that you will not be able to see the cardstock at the top and bottom of your strip - you just want a thin blue line to the left and right. Adhere your 12" strip down the right side of your page approximately 3.5cm from the right edge. Mat your photo with white cardstock. This mat should only be about 3mm wide. This is just enough to make it stand out from your patterned papers. Now, mat your photo with Scarlet Rec Daisy Paper. This time your mat should be approximately 1.5cm wide. This mat helps to give focus to your photo, but the paper is not so busy that it distracts from it. 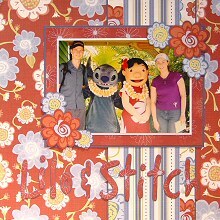 Finally, mat your photo with dark blue cardstock. This mat should only be about 3mm wide. It's purpose is to help your photo stand out from the busy background papers. Position your photo towards the top right-hand corner of your page, as shown in the layout above, and adhere. I recommend you position it approximately 2.5cm from the right edge and 3.5cm from the top edge. To embellish your photo, cut two large red flowers and four medium-sized blue flowers from your remaining Rec Sandbox Flowers Paper. Mat each flower on dark blue cardstock. This will make them stand out. Arrange as shown in the layout above, with one red flower and two blue flowers on the top right corner of your photo and the remainder on the bottom left corner of your photo. Finally, cut your title from your remaining Scarlet Rec Daisy Paper. I suggest trying to align each letter so that part of a daisy appears on them. Mat each letter with dark blue cardstock and arrange across the bottom of your page.